Buy the Farm . . . Share: Mama Mia! 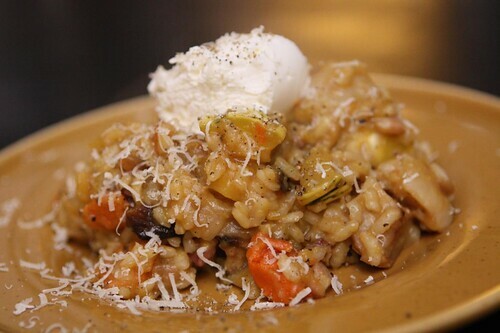 That's A-Canadian Risotto! We only have about seventeen or eighteen pounds of leftover Canadian Thanksgiving food so we're really in the winding down phase of the holiday. Jen, who generally cannot stand repeat meals, has finally reached her limit for Thanksgiving leftovers. I started off by rendering some bacon, thinking that would be a good start to warding off the Thanksgiving flavor. I tossed in some butter, a selection of the roasted root vegetables, some whiskey, chicken stock, salt, pepper, sage, and arborio rice. After the rice had fully cooked I added a pat of butter and served the risotto with a dollop of ricotta and some Parmigiano-Reggiano. 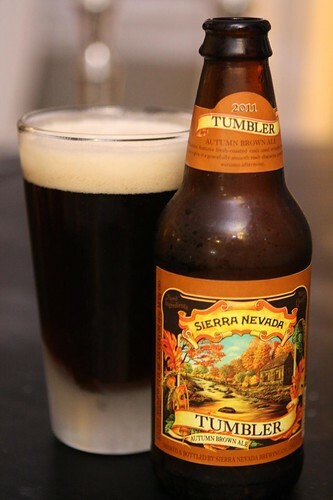 For beer I had a Tumbler Autumn Brown Ale form Sierra Nevada. I figured it was time for a little break from pumpkin ales. I'd had this beer on tap the other night and really liked it so I decided to break open the one in my beer cupboard cellar. It was tasty but I enjoyed the one on tap a bit more. This was partially because they served it in a nonic glass and that's just cool. Some day I hope to be able to have a nonic glass of my own. 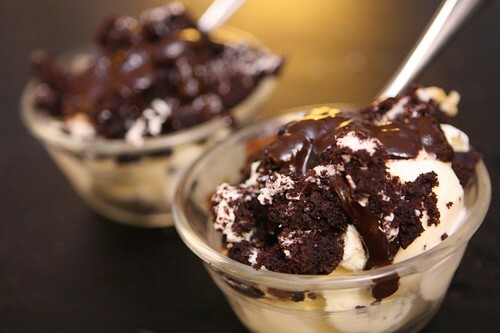 As a final course I scooped some vanilla ice cream and crumbled up some week-old whoopie pies on top with some melted chocolate to make these little sundaes. It's going interesting seeing if I can continue to carry these leftovers through a full eight days. The real challenge will be in trying to remove enough of the Thanksgiving taste for it to be palatable. It looks like Diane must have left herself logged in to Google. Jen maintains that it is not her mother talking. Oh, and I agree about leftovers.